No one likes being called privileged, but if you’re staying in the Maldives, well, you can deal with a little name calling. 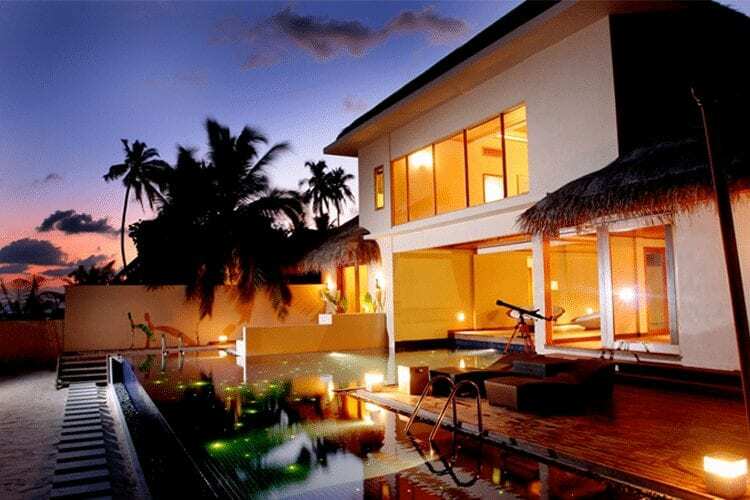 It IS a privilege to stay at any of outstanding villas that the Maldives has to offer. Maldives is super exclusive and, well, super expensive—but, hey, you get what you pay for. It is the only island destination in the world where your beach villa is basically on the sugary white sand and no more than twenty steps from the crystal-clear water (no weird zoning laws here like Hawaii, Tahiti, etc). Plus, the overwater villas are supreme. Even the most basic rooms at these resorts are huge, complete with private pools and incredible views. That said, it doesn’t matter if you’re staying in a crazy presidential suite or at what passes for a bottom-tier ocean villa. 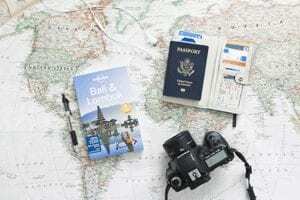 If, however, having the most unforgettable, tricked-out villa is a priority over everything else, these are the only six accommodations you need to consider when planning your honeymoon. They are hands-down the best of the best. Not only is Jumeirah Vittaveli one of the best rustic properties in the Maldives. Let’s talk about the beach villas. They are mere steps from the ocean with private, tiled pools that span the entire length of the villa, all the way to the back where you’ll find the outdoor bathroom (with hammock, outdoor showers, etc). There are no other suites like this in the Maldives. These 2,800-square-foot, bi-level villas are basically “floating” in the sea, reachable by dhoni boat (don’t worry… it’s a minute boat ride to get to the main island, and it’s 24-hour service). These ocean suites are equipped with their own private (and deep) outdoor pool, a terrace with glass-bottom floor, floor-to-ceiling, top-floor bedroom, glass-walled bathrooms with their own patios and literally the ocean as your backyard. These suites start at $1,330 a night, a total bargain considering the beach villa (1,980 square feet) starts at $1,013. Soneva is a hotel brand that has some of the coolest resorts in the Maldives, and while they’re all pretty rustic and low-key they’re most certainly luxurious. Soneva Jani, the newest resort that opened in November 2016, is huge for the Maldives, comprising five islands but surrounded by crystal clear lagoon, so you’re always immersed in that stellar beauty. 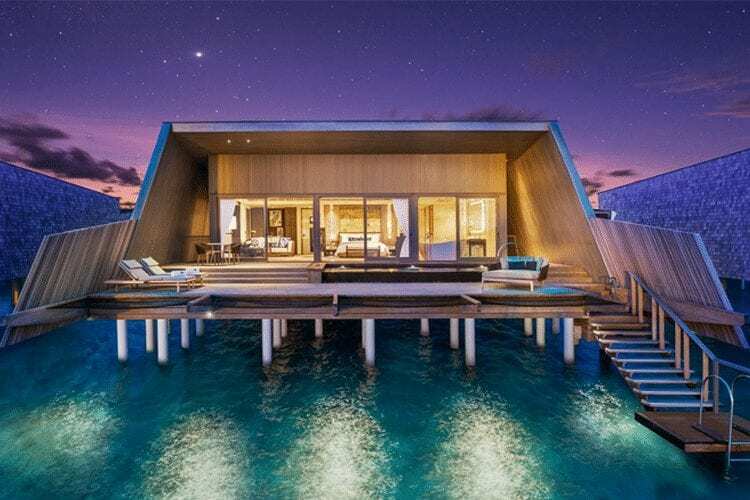 Book the insanely massive, bi-level, 4,423-square-foot overwater villa with slide. This is not a typo. 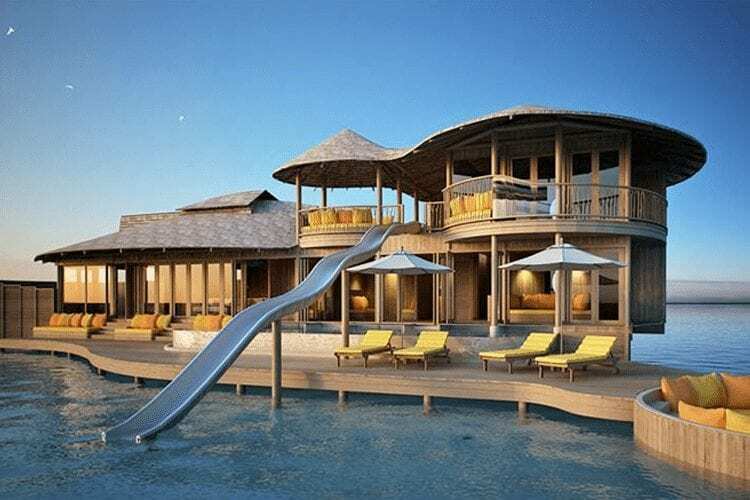 Soneva Jani is the only resort in the Maldives where the overwater villa has a curved water slide attached to it from the top floor that goes directly into the lagoon. Obviously, it was intended for families, but who are we to judge? It also has its own huge private pool, outdoor bathroom, and outdoor deck. You might ask: Do I really need all this space and a slide? Yes, yes you do. Even if you get a room without a slide, it’s the same size. The villas (with plantation wood, pitched roofs, and retractable ceilings above the bed for lazy stargazing) just happen to run huge here. Rooms start at $3,000 a night. 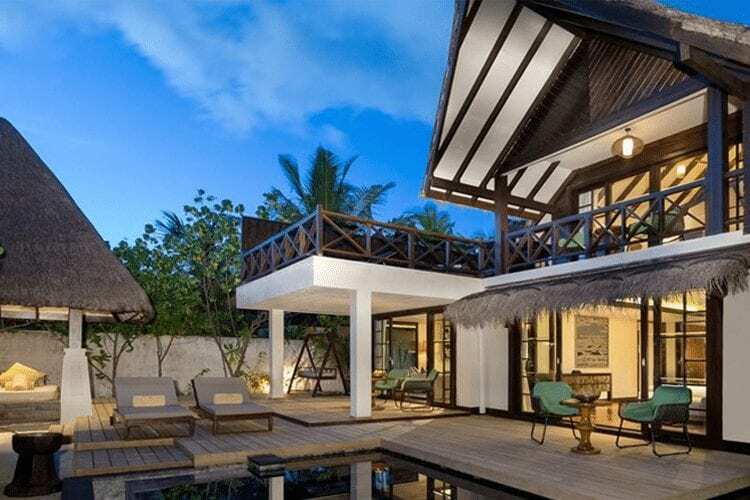 Not only is Huvafen Fushi a quiet, luxurious retreat for couples who never want to see other guests, the beach villas are some of the best in the Maldives. The villas aren’t huge, but that’s not the point. 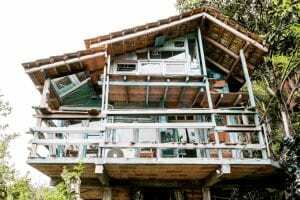 They are just perfectly sized, with an outdoor deck with private, fresh-water plunge pool that you’ll basically never use because you’re on an amazing beach and the ocean is just a waddle away. But that’s not what’s going to blow your mind. You’ll open the bathroom door and find a breathtaking, huge oasis that’s literally the same size of the room. The entire outdoor bathroom has yet another pool (yes, a pool in your bathroom, who would have thought? ), a lush garden, a thatch-roof cabana, a rain shower, and a stand-alone bathtub. You’ll never spend so much time in a bathroom in your life. The 23-acre St Regis Maldives Vommuli Island opened in 2016 and left nothing to the imagination. Buckets of money (that were probably made of solid gold) were poured into the hotel to carry on that St. Regis-level of opulence. You can feel it in anyone one of the 33, one-bedroom beach villas that flaunt eye-grabbing views framed by 20-foot-tall picture windows. But we’re making you stay in the overwater villa. There’s only 44 of them and they sell out fast, so book as far in advance as you can. At 2,000 square feet, these immense villas have their own private, 52-foot, tiled infinity pool set back on a teak deck, so it practically glimmers all day. There’s also four overwater hammocks, because why not? It also features sliding glass walls that separate the bedroom from the outdoors, including the marble bathroom with soaking tub. Oh, and if you do happen to leave your room, it’s the only resort with zero-gravity yoga offered. Just like the astronauts do! Another Soneva property, Soneva Fushi is one of the first resorts to open in the Maldives, in fact, it’s known as the “original deserted island hideaway.” They totally capitalized and branded villas based on Robinson Crusoe, the original castaway. 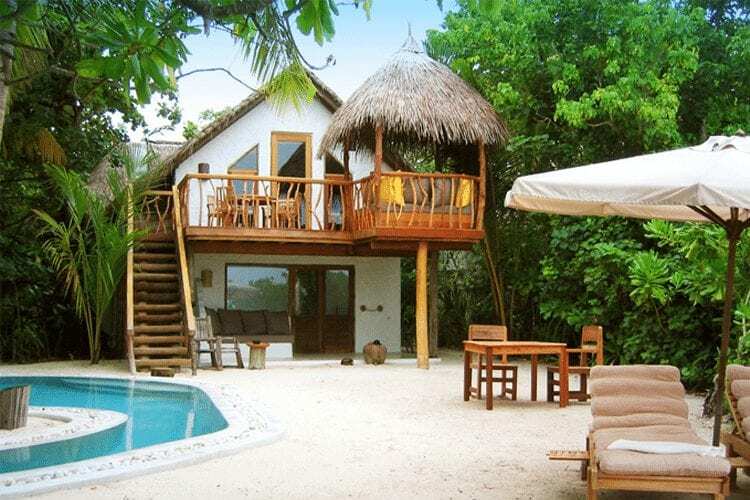 The Crusoe Villas are truely rustic—with thatch-roof hideaways straddling tropical jungle and white-sand beach—span 2,530 square feet with two levels equipped with their own private pool as well as a second-level outdoor deck. These duplex digs are mere steps from the sea, and they have a bit of a Lost feel to them (without the whole plane crash and meandering plot). Guests feel like they’re in a storybook when they stay, which is, by the way, totally romantic. Rooms from $1,356 a night. 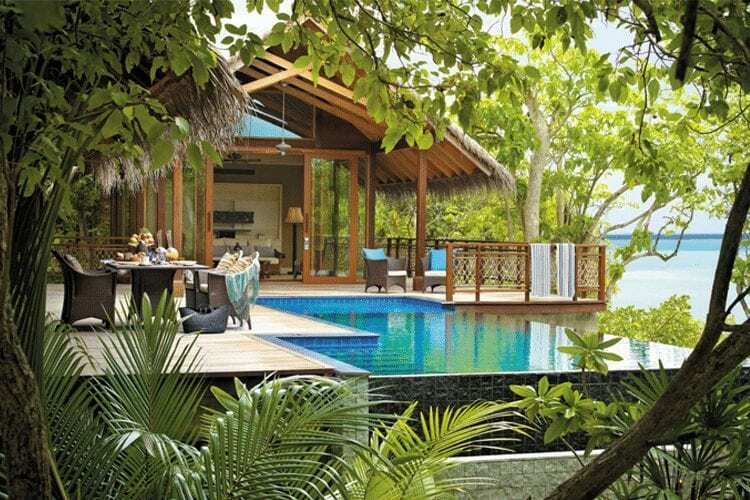 If you’ve ever had fantasies about living in a treehouse, Shangri-La Villingili Resort can make that a reality. Unique to the Maldives, the Ocean View Tree House Villa is set within the treetops, perched on stilts, so it’s actually an elevated experience. The romance-drenched, one-bedroom villa is massive at 2,468 square feet with an open-air terrace, private infinity pool looking straight into the ocean, personal villa host, 24-hour in-room dining, and an indoor/outdoor bathroom with open-air showers. With all-glass windows, you’re fully immersed in the natural setting, and you do really feel like Tarzan—if he had an American Express card. 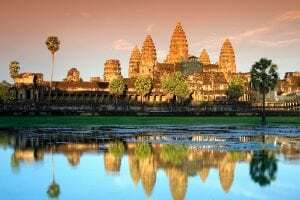 The most attractive thing of all: it’s only $663 a night and includes breakfast.